Photo frame features York College of Pennsylvania seal in top left corner and York College down the right-hand side. 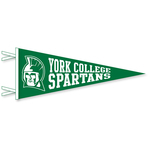 6" Tabletop stick with York College Go Make Memories imprinted on the front. 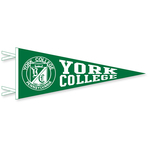 6" Mini tabletop stick with Friends & Family York College imprinted across the front. 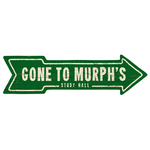 A green faded wall decor arrow with "Gone to Murph's Study Hall" in white. 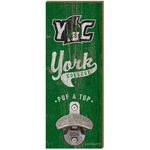 York College wooden wall mounted bottle opener with YC Spartan logo and antique washed look. 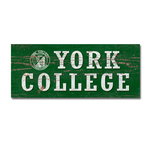 Antique vintage look doorway plank with York College and the York College Seal. Photo board with mini clothespins to hold up photos featuring the York College of Pennsylvania Seal and York College with an antique finish. Tabletop stick featuring the York College Seal and York College with an antique finish. 6" Tabletop stick with York College and the York College seal on the front.